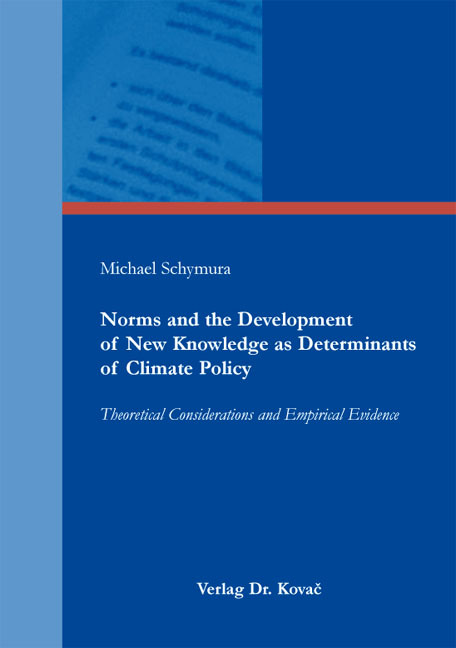 Norms and the Development of New Knowledge as Determinants of Climate Policy. Doktorarbeit von Michael Schymura, Verlag Dr. Kovač 2013, 282 S.
The evaluation of long-term effects of climate change in cost-benefit analysis has a long tradition in environmental economics. Since the publication of the “Stern Review? in 2006, the debate about the impacts of climate change on the economy and how to compare cost and benefits with each other was revived. The assessment of climate change mitigation policies mainly depends on three not mutually exclusive decisions: First, the discount rate chosen, since costs are incurred today and long-term benefits occur in the future. Second, the uncertainties related to the problem of climate change. This debate was spurred by the literature surrounding Martin Weitzman‘s ‘dismal theorem‘, stating that the unknown unknowns could be too large for cost-benefit analysis of long-term climate policy measures. And third, the treatment of technological change in economic models of climate policy. This dissertation contributes to all three mentioned aspects and consists of two interrelated parts. First, I discuss norms, economic welfare criteria, and catastrophic risks in the context of climate change. This first part is closely bound to a discussion of the Stern Review. The second part of the dissertation deals with technological change in its various dimensions and addresses several questions: How is technological change taken into consideration in large-scale environment-economy models? How do certain inputs substitute each other? And how does technology affect energy intensity, a key parameter for meeting targets set by climate policy? Alongside these questions, I also discuss how the production of knowledge takes place in an environmental and resource economics framework and how knowledge production patterns have changed during previous decades. While the first part is of theoretical nature, the second part is mainly empirical. Summing up, I suggest approaches towards long-term evaluation of climate policies and how some methodological drawbacks of the „Stern Review“ could be improved. Several related insights are derived which shall foster and support a discussion on how to treat the long run impacts of (catastrophic) climate change in economic modeling.